Adjustable, attractive, and said to be the world's smallest on-ear headphones for sleep; so flat and thin that you may forget you have Bedphones on! Intrigued? With a 30-day money back guarantee and a one-year warranty, there's no reason not to try them out. Note: Good Night's Rest is supported by affiliate commissions. What Are DubsLabs Bedphones Made of? What Is the Sound Quality of DubsLabs Bedphones? How Does It Feel to Wear DubsLabs Bedphones All Night? Does DubsLabs Offer a Trial Period, Return Policy and Warranty? Have you ever had trouble sleeping because of bothersome sounds? Cars on the street outside your window, someone else in the room snoring, the constant noise of a CPAP machine, even ringing in your years due to tinnitus—these and more may affect sleep onset. You can try any number of bedroom noise reduction measures, of course; but many people prefer to combat sound with sound, in the form of white noise or calming music. The latter can even help with mood and sleep disorders, such as anxiety and insomnia. However, listening to music unobtrusively to help with sleep comes with a whole set of issues. Headphones are the logical choice, but most models are often too bulky or too flimsy, and just not really designed to be used in bed. Enter: DubsLabs. 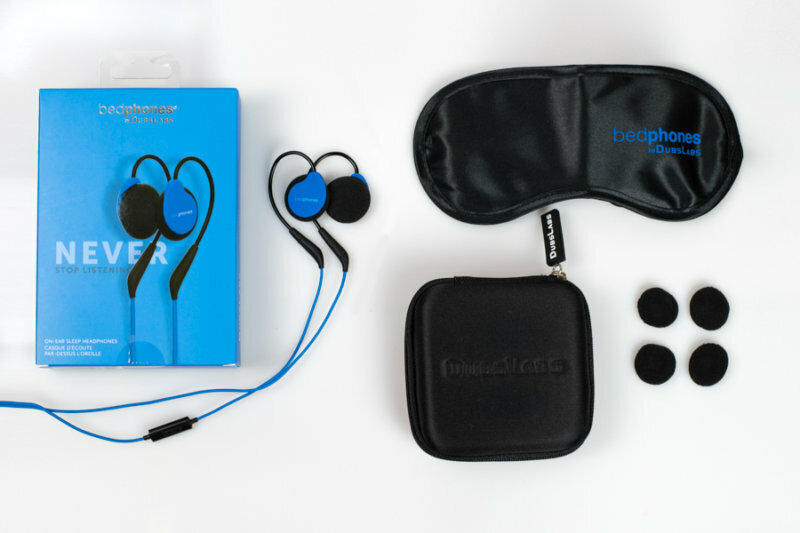 Headquartered in Oregon, the 2011-founded company has—from the very beginning—made headphones, called Bedphones, specifically for sleeping. What is it about Bedphones that makes them great for sleep? To answer that, let’s look at the product’s materials, design, and additional offerings. The main parts are the cable, speaker covers, drivers, jack, microphone and button remote. Cable. PVC is used for the 51-inch long cable. It leads up to the rubber-coated and flexible memory wire ear hooks, too. A cable slider is also added to help fix the product in place. Speaker covers. These are made of acrylonitrile butadiene styrene (ABS)—a popular kind of thermoplastic due to its low production cost and many applications. Again, this part comes with a rubberized coating. Speaker drivers. These are what converts electric signal into sound. They’re made of metal and feature a 23 mm diameter. Thin and flat on Bedphones, they’re also covered with foam. Audio jack. Also called a phone connector or a jack plug, the gold-plated aluminum one used by Bedphones is the 3.5 mm size that’s standard for most portable headphones. Microphone and button remote. This inline microphone with its accompanying single button remote allows you to take calls from your smartphone hands-free. It also lets you pause, play and skip tracks that are on your playlist. DubsLabs claims that Bedphones are the world’s smallest on-ear headphones, and we’re inclined to agree. The entire product is lightweight at around 3/4 of an ounce or more or less than 0.05 pounds. Each speaker is less than 1/4 of an inch thick. 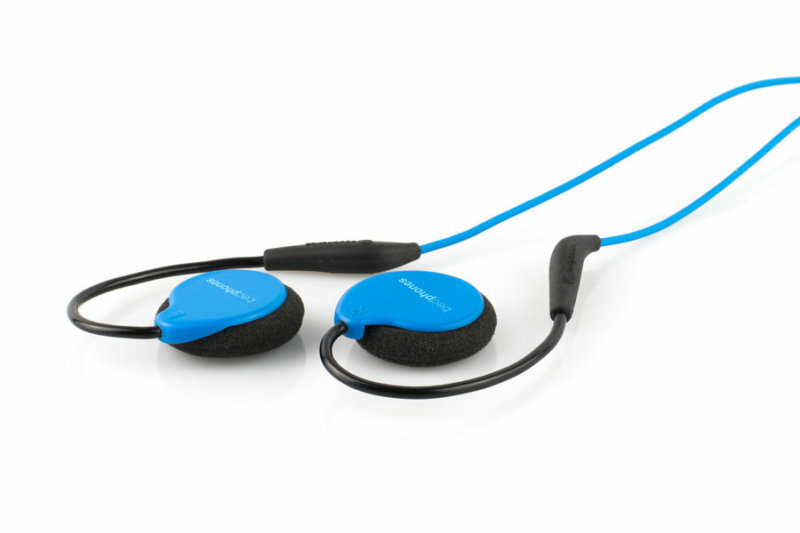 Unlike some sleep headphones that feature a headband to secure speakers over your ears, Bedphones have flexible hooks. You can bend and mold and adjust these to secure the sleep headphones and fix them in place infinite times. Do DubsLabs Bedphones Come with Accessories? 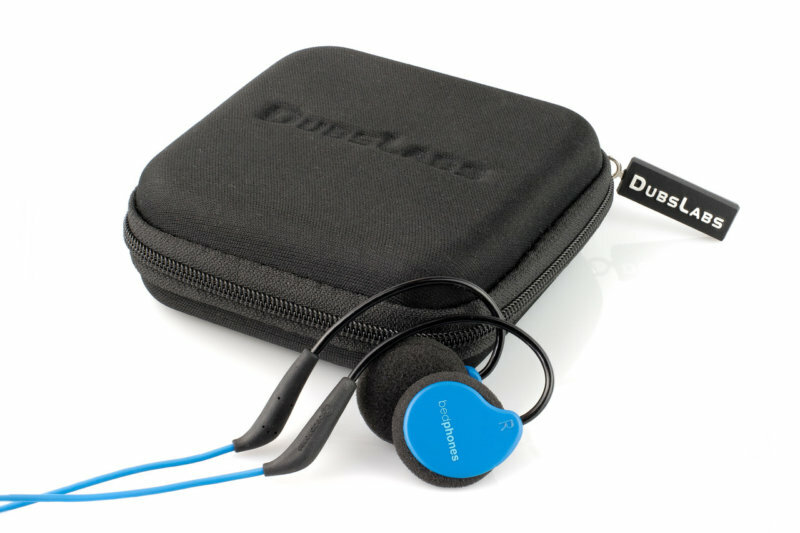 Each Bedphones purchase comes with a compact case for carrying and storage. There’s also a satin eye mask and two pairs of replacement speaker foams. While this is not technically included in the box—and really, you can use this even without the DubsLabs product—there’s also a free Bedphones mobile app that’s available for both iOS and Android. This helps you manage the music you listen to during bedtime and beyond, with a timer mode and even a smart mode that stops music once your smartphone senses that you’re asleep. Worth mentioning here that this mode only works, obviously, with phones that actually have an accelorometer to detect movement—or lack thereof. For a small pair of headphones at this price point, the sound is pretty good. It’s not the best, but for sleep onset, the amount of detail doesn’t have to be studio quality. Also: It’s important to note that unlike some headphones marketed for sleep, Bedphones are not meant to be noise-cancelling. Here’s some additional information for the audiophiles out there: Bedphones have an impedance of 32 Ω ±15% and a frequency range of 20Hz-20kHz. What do these numbers mean? Simply put, low impedance headphones require much less power for higher audio levels; so it’s best for battery-powered and portable gear like smartphones and small music players. Bedphones have an impedance that’s just a hair above what’s generally considered low—less than 25 Ω—which means that while they may demand a little bit more power, they’re also less likely to be damaged from overloading; and can be used with a wider range of compatible devices. Frequency range, on the other hand, is simply the amount of frequencies you are able to hear out of the product. Like most standard headphones, Bedphones allow you to hear the entirety of the generally accepted spectrum of audible sounds: from treble highs to bass lows. If your Bedphones fit perfectly—more on that later—you’ll be able to enjoy music, white noise, binaural beats and whatever else you feel like listening to without any trouble; and even though they’re on-ear headphones, the sound isn’t likely to leak out enough to disturb anyone else who may be sleeping near you. Bedphones come in two colors: black and a vibrant blue. Not sold on the idea of Bedphones completely? There are other DubsLabs variants that may be a better fit for you. Do You Need Wireless DubsLabs Bedphones? There is a wireless version of Bedphones with 13 hours of battery life and Bluetooth compatibility. It’s sold at much a higher price point and is only available in one color combination—black speaker covers and blue cable—but it is much better for fussy sleepers that toss and turn. A further enhanced version of this is Versafit, which is a sweat-proof Bedphones Wireless marketed for those with an active and sporty lifestyle. The thin speaker design that works for sleepers also fits snugly under many sports helmets; and because the product isn’t noise-cancelling, they are safe for use during workouts where you need to still be aware of what’s going on around you. Versafit was launched early in 2017, and comes in grey and green. Are DubsLabs Bedphones Easy to Use? There is an initial adjustment that you need to make once you get your Bedphones. You need to mold the memory wire ear hooks to fit your ears contours properly and hopefully in such a way that it causes no discomfort and allows for the best sound quality. To do this, for both left and right earphones you are instructed to position the speaker against your ear and directly over the ear canal; and then bend the memory wire up and over the back of your ear. 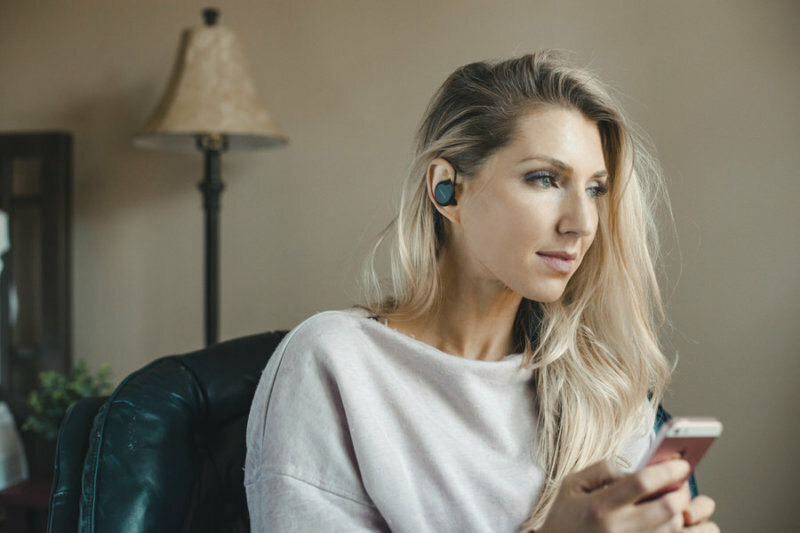 Finding a fit that works perfectly takes time, so you shouldn’t be afraid to adjust the memory wire and the angle of the speakers against your ears. A slider on the cable is provided to tighten the Bedphones, at the front or back of your neck, and keep it secure and in place throughout sleep. Once you’ve found the fit that works for you, Bedphones should be a breeze to use. DubsLabs’s patented design is versatile and adjustable, and is meant to be good enough to accommodate everyone. The truth? Human anatomy isn’t homogenous enough for that. If it fits like a glove, you probably will forget that you’re even wearing them—no matter what your sleeping position is. We’ve come across numerous positive reviews of the product that confirm this! However, if your ears are not the correct shape or size, it can be difficult to find a sleeping position comfortable enough to maintain while wearing Bedphones. The bulk of negative customer reviews cite this—and flimsiness, which we will discuss in a bit—as a major disappointment. In terms of comfort as it relates to sleep onset, great fitting Bedphones are probably be a godsend for people wanting to take calls and listen to music without possibly affecting their sleep-wake cycle. Smartphones are a source of artificial light, and the temptation to use them—for browsing social media, playing games, etc.—is only strengthened by actually holding them; so the inline microphone and the button remote helps a lot. DubsLabs founder Eric Dubs wasn’t playing around when he decided to develop and manufacture sleep headphones. First of all, there is a measure of comfort to be had with DubsLabs specializing in headphones—and more specifically, headphones for sleep. This is not some big name, faceless corporation or all-around manufacturer getting into a niche market. Dubs actually went through almost one hundred handmade prototypes before the first version of Bedphones was launched, and the company didn’t stop improving upon the product after that, either. In fact, what’s available now is actually called Bedphones Gen. 3.5! Compared to the original Bedphones, Gen. 3.5 has speakers that are 15% thinner, ear hooks that are more ergonomic, and cables that are thicker and more durable. The microphone and button remote are also new additions. The point we’re making here is that DubsLabs seems to want to grow along with its customer base; and is consistent when it comes to making improvements and additions to make their products better. That’s a great unsaid company promise. How Is DubsLabs’ Customer Support? As we looked at customer reviews, we noticed that this product elicits a very interesting average response from its users—in that there is no real average. People either love it or hate it, which could be the result of the fit. There is also the issue of flimsiness, especially with the wired version. Previous Bedphones designs—remember that we’re up to 3.5 now, several iterations away from the original—were apparently prone to not some parts not working properly or straight up failing. Is this a cause for concern? Yes and no. Most negative feedback had to do with product issues, and a great number of these still mentioned great customer support from DubsLabs. The customer service team is responsive and attentive, and—as we will note below—adept at handling returns if needed. We also appreciate the extensive FAQ section on the brand’s official website, as well as the live chat support bot. When we initially reviewed Dubslabs Bedphones’ previous iteration last year, we noted a lack of customer support, and we’re thrilled to see that this has been rectified. Yes, yes and yes! This is another thing that’s improved greatly since we published our initial DubsLabs Bedphones review. The existence of a 100% satistafion, 30-day money back guarantee is clearly noted in every product page on the brand’s official website; as well as a one-year manufacturer’s warranty. This means that when you purchase DubsLabs Bedphones, you have 30 days to see if it is compatible with the way you sleep. The warranty also eases many of our worries regarding potential durability issues and flimsiness. How Much Do DubsLabs Bedphones Cost? As of this writing, DubsLabs Bedphones Gen. 3.5 are $59.95, with free US shipping. If you’re in the US: Once you place an order, expect it to arrive within two to five days. Bedphones Wireless is significantly more expensive at $99.95, but the design does potentially make Bedphones much more comfortable and less prone to breaking. Visit DubsLabs & Find Bedphones Deals Now! Bedphones are attractive, and their adjustable nature combined with the mobile app appeals to us here at Good Night’s Rest. That the product is lightweight and includes a microphone and button remote is also ideal. We’re all about minimizing exposure to artificial light at nighttime, and these features help a lot. When we initially reviewed DubsLabs Bedphones Gen. 3, we were skeptical because of a lack of a clearly stated money back guarantee and warranty. However, in this current update, we’ve found that this is no longer true! We can wholeheartedly recommend this product to anyone looking for sleep headphones with these customer-friendly features in place. If you sleep hot or feel uncomfortable wearing headbands to sleep, DubsLabs may just be the innovative design to fit your sleeping habits! And if you’re an active sleeper and are worried about wires getting tangled while you’re in bed, check out DubsLabs Bedphones Wireless.